How to add close button to a JTabbedPane Tab? 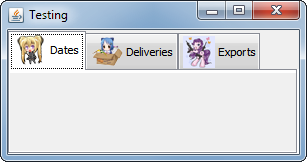 I'm working in with a JTabbedPane, I need to add a close button in the tabs to close the current one. I have been searching and as I understand I must extend from JPanel and add the close button as they say here But, is there a way to add the close buttons extending JTabbedPane or is there a easier way to do it? Thanks in advance, I really appreciate your time and your help. Essentially, you're going to need to supply a "renderer" for the tab. Take a look at JTabbedPane.setTabComponentAt(...) for more information. The basic idea is to supply a component that will be laid out on the tab. I typically create a JPanel, onto which I add a JLabel (for the title) and, depending on what I want to display, some kind of control that acts as the close action. The above example will only remove the currently active tab, there are a couple of ways to fix this. I found a tab example (from the java site) that appears to do that, at least in theirs. (Though I thought, when I tried it in the past, that it also closed the currently selected tab, though it works properly when you run their example, though I think when I updated it to work on a tabbed java notepad, it was closing the currently selected tab, though maybe I did it wrong. Yes, my thing is working now! This WILL work for the actual tab, rather than the currently selected tab! Hopefully you have got the answer to your question. I want to give a link that was very useful for me. Here is some code as well. I made some changes in the code of oracle. Giving the possibility to add an icon to the tab , plus the close tab button. Hope that helps. Check out Peter-Swing here. It has a JClosableTabbedPane class in it, as well as many others. When you download the jar file you can run it and have examples of all the classes. Not the answer you're looking for? Browse other questions tagged java swing tabs jtabbedpane or ask your own question. How to add button in JTabbedPane background?